Successfully Added Pink Digital HD Camcorder With 3 Inch Touch Screen (30FPS) to your Shopping Cart. 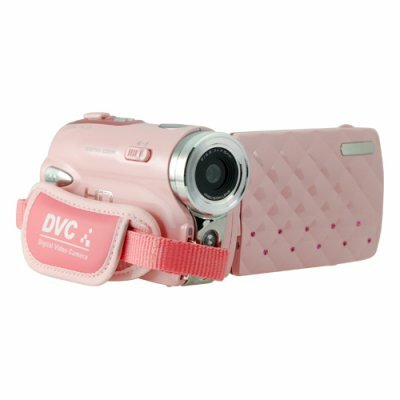 Stylish HD camcorder with a 3 inch LCD touch screen and it's Pink. From video recording to image capturing. This beautifully well designed digital camcorder built to perform effortlessly, coming with 2 SD card slots that gives you tons of storage space for capturing video and photos. Each SD card slot can handle 16GB's, in total you are getting 32 GB's, just like the new iPhone 3Gs that comes with 32 GB's or storage space. The 3 inch LCD touchscreen makes operating this camcorder simple. With one mode touch select either video recording, photo capturing or voice recording. Never miss a moment thanks to its quick response and effortless performance. With the ability to take H.264 video (MOV) at 30 frames per second and a professional grade lens + image sensor, this will make you enjoy all your picture taking and video shootings better than ever before. From the easy to use button layout and the beautiful 3" viewing screen, to the on-the-fly expandability with SD memory cards, everything has been designed with maximum end user ease and convenience in mind, and to add that final extra touch, it comes in Pink color. The DV17 HD video camera works great as both a video and still picture camera and comes as a kit with just about everything you need to get started; Camcorder, camera bag, battery, charger, software, and all required cables included. You just need to add your own SD memory card (up to 16 GB's) and you are ready to start shooting in HD brilliance. With the included macro feature, take super close of your desire objects and see the amazing brilliance in clarity. This is a amazing Pink HD digital video camera is in stock now and available to you at an amazing factory direct wholesale price, straight form the leaders in digital wholesale electronics, Chinavasion. No, 16 GB is a lot of memory, you can record an hour and a half of video on HD quality and that only comes to 2.95GB, when one SD card reaches full capacity, the camcorder will switch to the other SD card, all you have to do is press record, or continue taking pictures. Can I use the DV17 with a standard tripod? Is this DV Camcorder as good as the Power Puff girls DV Camera?